I'm going to have to send my husband out of town while I stay home and eat nothing but cake more often. I got so much knitting done last week! 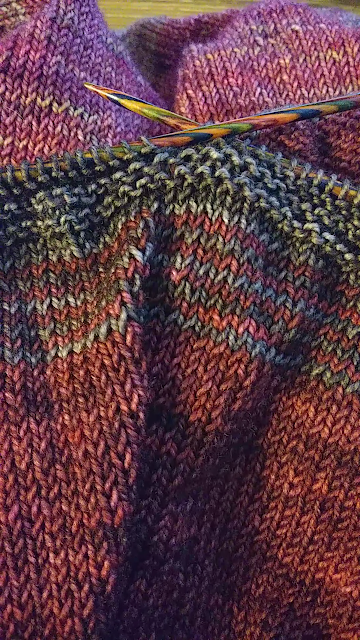 The body of my So Faded sweater is almost finished. The sweater is a little big. Cough, cough. Someone may have failed to gauge swatch before casting on. But I think it will be okay with a few modifications. I decreased a few stitches a couple of times and I've decided to do a split hem to avoid that blousy (blousey?? Spellcheck won't tell me.) look at the bottom. I think I'm going to be very happy with it. The loose style will look a lot better on me than a fitted sweater anyway. I'm going to have to figure out something for the sleeves, but I'll deal with them once the body if finished. So, I need to find somewhere to send my spouse this week. Got a spare room? Nope, no spare room here. And no time for another husband either. I think he suspects something fishy is going on because I suggested (rather strongly) that he go play golf today. A new playmate for him sounds like a good idea though. :) Thanks! I'm Loving how the colors in this sweater have blended together. I'm so happy with it! gauge? what is that? ha ha, I do that all the time, that is why I knit repeatedly with the same yarns cuz I know my gauge and then don't have to do that part. Me too! It's also why I tend to knit shawls and scarves instead of sweaters.